The following will be investigating the idea that possibly two or more individuals may have been involved in the Zodiac crimes, or at least some of the crimes. It is not necessarily something I subscribe to, but certainly would not dismiss the idea out of hand, particularly when we consider the nature of the first two crimes at Lake Herman Road on December 20th 1968 and Blue Rock Springs on July 4th 1969, and many of the unanswered questions. Some of the following will consider new angles regarding the crimes, that don't necessarily follow the widely accepted Zodiac narrative. At Lake Herman Road, what strikes you, are the occupants of two vehicles observed in the run up to the murder of David Faraday and Betty Lou Jensen. These occupants, despite the publicity these murders generated, never came forward. This may be a fear of implication in the crime, nevertheless, the owner of the white Chevrolet Impala, spotted parked unoccupied in the Lake Herman Road turnout by three witnesses and the blue Valiant observed by William Crow, who stated he was pursued by two Caucasian males in this vehicle within 90 minutes of the double murder, have all remained unidentified. One has to ask, why is the empty Chevrolet Impala sitting parked in the turnout for an extended period, bearing in mind it was late evening, extremely cold and pitch black. What were the occupant/s of the vehicle doing that night, considering they were never observed in the vicinity at any time by Robert Connelly, Frank Gasser or Bingo Wesner. The 'Blue Valiant' story by William Crow is difficult to dismiss as irrelevant, having occurred so close to the crime scene, and on the face of it appeared threatening. William Crow would later change the recollection of his encounter that night, in addition to altering his vehicle description to a white Chevrolet. This can be easily interpreted as witness embellishment. "Since that time, you have become a practicing attorney and are reportedly employed by the local government in Solano County. In February of 2004, you spoke to Zodiac researcher Howard Davis. At this time you had a much different story to tell. You clarified the reason you had pulled over to the side of the road near the pumping station as being to learn how to use "toggle switches" on the dashboard of your girlfriend's car. The chase is now much more detail-filled and very dramatic. The car tried to gain on you and, in trying to get inside your left rear quarter panel, presumably tried to force you off the road. He flashed his lights on and off. In taking the turnoff to Benicia, you apparently had to execute a high speed "evasive" maneuver which the less agile, older car could not handle. There was just one person in the car now and his description was eerily like that which was promoted for the Zodiac killer (i.e., short hair and glasses) after October 1969. The car was now remarkably the "white Chevy" that two other sets of eyewitnesses described that night. You stated that your girlfriend lived in (and presumably purchased her sports car in) San Francisco (or was it Napa?). After the encounter, your common sense kicked in and you went home." "He was driving his girlfriend's sports car and he was testing it out and adjusting the motor. He was parked in the open area by the pump station and he observed a blue car, possibly a Valiant coming down the road from Benicia towards Vallejo. They passed his location, stopped in the middle of the road and he saw the white lights of the reverse come on and the car started backing up towards them. Mr Owen put the car in gear and took off at a high rate of speed and the car followed him at a high rate of speed. They did not attempt to gain on him, but when they got to the turn off towards Benicia, William Crow turned towards Benicia and the other car went straight ahead. The subjects were both Caucasians and there is no further identification on the car or the subjects." The level of threat these individuals posed is indeterminable, however, they never presented themselves to investigators to clarify their account of proceedings, so the question will still persist, to what extent they were connected to the subsequent murders that night. The significance of the white Chevrolet Impala is equally unclear. The Zodiac Killer described his attack on David Faraday and Betty Lou Jensen "What I did was tape a small pencel flash light to the barrel of my gun. If you notice, in the center of the beam of light if you aim it at a wall or ceiling you will see a black or darck spot in the center of the circle of light about 3 to 6 inches across. When taped to a gun barrel, the bullet will strike in the center of the black dot in the light. All I had to do was spray them as if it was a water hose; there was no need to use the gun sights." How difficult is it to control two frightened teenagers in near perfect darkness using just a 'pencil flashlight', bearing in mind his vehicle was supposedly parked alongside the victims Rambler, providing limited auxiliary lighting from the headlights of his car. The most obvious position to place his vehicle was to the right and slightly behind, to not only blind his victims and box them in, but to provide some extra illumination in the comission of the crime. In short, eight bullets were recovered from the crime scene, and only one failed to exhibit 'right hand groove class characteristics' - the one retrieved from David Faraday's head at autopsy. Ten casings were detailed in the crime scene sketches, but only nine were sent to the Department of Justice for testing. Since nine of the casings were retrieved from the turnout floor, it seems likely the tenth casing, marked as sitting on the front passenger side Rambler floor, got towed away with the vehicle and separated from the rest of the casings. This, therefore, could never have been tested. If this tenth casing had exhibited different characteristics to the other nine, then a plausible link could be attributed to this casing and the 'odd man out' bullet. It makes perfect sense, as a head shot into David Faraday from his left side by a right handed shooter would eject the casing to the right and rear, in direct line with the open passenger door, where it was ultimately found. The same could be said of a left handed shooter securing David Faraday from behind. But without ever locating this missing casing we will never know. Mike Rodelli responded to this with some additional information, which if correct defies belief: "That missing casing is interesting. I remember being at Russ' home for several days in 2003 and he told me that he had one of the shell casings from LHR. We looked through several ashtrays of junk trying to find it but never did. I wonder if the one he had is the missing one, since the car would have been placed in possession of the SO after the shooting, as seen in several videos. Maybe he took it as a souvenir." If this were the case, then it is highly unlikely this promising lead will go anywhere, but it certainly does not discount the possibility that a second gun and second shooter may have been involved that night. Were the two Caucasians spotted by William Crow still en scene, and what role, if any, did the white Chevrolet Impala play. Comparing vehicles in the Zodiac attacks is extremely limiting, especially when considering Michael Mageau's less than reliable eyewitness account. Understandable after the horrific attack he was subjected to at Blue Rock Springs Park. On the left is a blue 1966 Chevrolet Nova, which when compared to the 1966 Plymouth Valiant above has a similar square looking design. 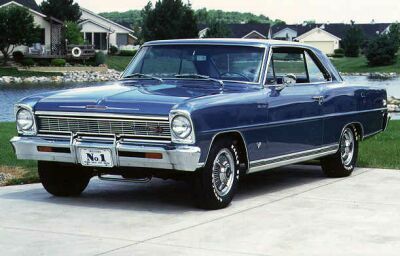 In addition, the Chevrolet Nova II and Chevrolet Nova II 327 exhibit equally similar features and specifications. These vehicles have been selected for a reason. The three women at Lake Berryessa, who spotted a suspicious man in the run up to the double stabbing of Bryan Hartnell and Cecelia Shepard, described his vehicle as a late model, 1966/7 Chevrolet, light or sky blue in color, with long rear taillights rather than round. These Chevrolet Nova models have long taillights. Not a great match up admittedly, however, the police took tire impressions of a vehicle they suspected parked by Bryan Hartnell's Karmann Ghia on the day of the crime, that may have been the killer's vehicle. The mystery man spotted by the three women may not have been the Zodiac Killer, but the tire tracks or tread impression widths of a Chevrolet Nova, if he drove such a vehicle, are almost identical to the track width of the observed tire impressions by police. This is what it states in the police report "Reporting officer observed one set of tire impressions approximately 20 feet to the rear of the victim's vehicle. The suspect track nearer the fence measured approximately 4 1/2 inches in width and showed a parallel tread design. This tread design was photographed by Sgt T Butler and then a plaster cast was made by reporting officer. The tire impression furthest from the fence measured approximately 5 1/2 inches in width. The distance between the inside of the left tread to the inside of the right tread measured approximately 52 inches." Track width is a measurement from tire center to tire center. If you look at the specs of a 1959 or 1960 Chevrolet Impala, the tire width is 205 mm or 8.07 inches. This would mean the center of the tire is situated at roughly 4 inches. It would be nice to think, that if we added the 4 inches of both tires to the 52 inches, measured to the inside of the tread above, we would get 60 inches track width, the exact front width shown here of the 1960 Chevrolet Impala, although 59.3 in the rear. However tire width and tread width are not the same, shown in the photograph above, where the rubber cambers off on the edge of the tire, meaning the tread width is often smaller than tire width. This is often different bearing in mind the aspect ratio of a tire, given as 75% on a 1960 Chevrolet Impala, in respect to rim size. Here is a brief explanation on Youtube. The police report gave us 52 inches to the inside of the tread, left and right, depicted here on the left. The tread value of each tire is 5 inches, that is 2 1/2 inches to the center of each tire (excluding the camber shown in yellow). With two tires, that amounts to 5 inches. Thereby the total track width (measured to the center of each tire) is 57 inches. This would suggest that the suspect vehicle, if it is related to these tire impressions at all, is not a 1963 Chevrolet Corvair with a track width of not greater than 55 inches, but shy of the 60 inch track width of a 1959 or 1960 Chevrolet Impala, seemingly ruling both vehicles out as being responsible for the impressions discovered by responding officers. Even taking the actual values of tread width of 4 1/2 and 5 1/2 inches, the track width would fall in between the specifications of both vehicles. ​The three girls description, suggested a 1966 or 1967, late model blue Chevrolet, 2-door, with one highlighting long taillights. The question being, could this description be enough to provide a match to the tire impressions found close to Bryan Hartnell's vehicle. We are looking for a Chevrolet somewhere in the range of 57 inch wheel track width. Here are examples of the Chevrolet II Nova, beginning with the 2-door '66 model. Supplemental to this is the Chevrolet Nova II SS 327. Here is a Youtube video of a 1967 marina-blue Chevrolet Nova II 327, featuring front, side and rear views. Note that it is 2-door, possessing the long, rather than round taillights. ​If we take the median value of the tire impressions from the police report, as already stated we have a track width of 57 inches. If we take the low end estimate of the tire impressions of approximately 4 1/2 inches, this gives a track width of 56.50 inches. Here are the complete specs of the Chevrolet Nova II from two sources. Here and here. The track width for the front is 56.80 inches, very close to the 57.00 inches, estimated from the police report. The track width for the rear is 56.30 inches, very close to the 'the suspect track nearer the fence measured at approximately 4 1/2 inches in width.' This was the closest fit I could find matching as many specifications as possible, the color, make, year, taillights, door and track width, combining both scenes at Lake Berryessa, but this of course is the best one can manage without comprehensive identification. Had William Crow identified a blue Chevrolet Nova instead of a blue Valiant, then its significance may have ramped up a notch, unless of course he was mistaken on December 20th 1968, after all he apparently only saw its front and rear end in near pitch darkness. He would eventually change his statement in 2004, to a white Chevrolet, so taking half of each statement, we could manufacture our blue Chevrolet like magic, but this is stretching the rabbit out of the hat. Seven months after Lake Herman Road the killer struck for a second time, attacking Michael Mageau and Darlene Ferrin at Blue Rock Springs Park. Again, two vehicles may have come into play. Michael Mageau described a vehicle pulling alongside Darlene Ferrin's brown Corvair, then leaving in the direction of Springs Road. Approximately five minutes later, this vehicle, or a different vehicle, pulled up about ten feet to their rear. The occupant exited his vehicle, torch and gun in hand, approached the couple's vehicle and fired five shots at the defenseless victims through the open side passenger window. He then retreated, before returning to fire off a further four shots. Who was the man who pulled alongside the victims car five minutes prior to the attack. If this man was the eventual shooter, why did he drive away when he had the perfect opportunity to attack the couple in the first instance. If he was unrelated to the murder and attempted murder, why did he pull alongside the couple in an empty car park in which he could have parked anywhere, and in similar fashion to the unknown occupants of the vehicles at Lake Herman Road, he never presented himself as a material witness to police regarding the events that night. Was the occupant of the vehicle who initially pulled up alongside the victims Corvair, surveying the scene for an accomplice, possibly known to Darlene Ferrin. Hence, the strategy of parking a vehicle alongside, then behind. This certainly wouldn't be the first serial killer to target someone known to them, before continuing their rampage. Then there is the additional phone call to family members in the early hours of July 5th 1969, other than the call to police dispatcher Nancy Slover. This theory I doubt will ever be resolved. This attack, and the one at Lake Herman Road, both may have displayed some sort of reconnaissance before the murders ultimately took place, with unidentified vehicles and persons unknown present themselves before each crime. At Lake Herman Road we had an extensive DOJ ballistics report (although missing one vital casing), along with detailed, if inaccurate police sketches. Blue Rock Springs Park on the other hand, has very little. No extensive ballistics report available to the public and no photographs of the crime scene whatsoever. We know that nine expended bullet casings were retrieved from the crime scene, seven found to the right side of the Corvair and two on the back seat floorboard of the vehicle, as though the killer had leaned into the vehicle to deliver the final shots at Michael Mageau, who had clambered to the rear of the vehicle to escape the initial barrage. The strange thing about this shooting, is that the killer had unleashed nine shots towards his victims, yet despite both Michael Mageau and Darlene Ferrin being alive after the first five shots, he retreated according to Michael Mageau. Why didn't he just use up the whole magazine, or nine shots in one 'sitting', so to speak. Although not privy to the Blue Rock Springs ballistics report, I suspect the expended casings were compared and shown to have been the product of one firearm, but who fired the nine shots. This may seem a stupid question, but Michael Mageau by his own admission, stated a vehicle pulled up behind them with the headlights on and a man exited with a flashlight. At near midnight with limited alternative lighting, this would have made it extremely difficult to ascertain how many occupants were present in the assailant's vehicle. Michael Mageau stated that the attacker retreated after the first volley of shots. It is entirely plausible that the assailant handed off the gun to a second man in the car, who was then told to 'finish the job'. They came as a team and wanted to be equally involved. The first assailant firing off five shots, the second four shots. This cannot be proved or disproved, especially considering Michael Mageau was blinded by the headlights from behind, in accompaniment to the flashlight, and for a brief period had no view of the assailant/s vehicle, as he had sought respite on the back seat of the Corvair. His account of the night and his description of the assailant's vehicle are extremely sketchy, and could also throw into doubt the actual number of perpetrators involved on July 4th 1969. Lake Berryessa is totally different. We know that one masked man was responsible for the stabbing of Bryan Hartnell and Cecelia Shepard. What we don't know is who wrote on Bryan Hartnell's car door. We assume it was the same person who committed the stabbing. Lake Berryessa had limited escape routes by car, with the crime being perpetrated during daylight hours, with boats still circling the lake. Would our killer be eager to leave the scene of crime as soon as he reached his vehicle? Would he take the time to write on Bryan Hartnell's Karmann Ghia? Or would it have been much easier for a second person to have written on the vehicle while the attack was underway, so as to facilitate a quick exit along Knoxville Road? Again, neither can be proved or disproved. Finally, we have the Presidio Heights murder of Paul Stine on October 11th 1969. There have been many debates on where the actual murder took place, in view of no gunshot being heard by the three teenagers across the street, or any other resident for that matter. But what we do know, is that we cannot inextricably link the man observed in the taxicab with Paul Stine's shooting. By the time the three teenagers had looked out of their window that night, all they observed was a man in the front seat of the taxicab, presumably tearing off a swatch of Paul Stine's shirt. The shooter (his accomplice) may have already vacated the taxicab before the teenagers came to the window. Nobody knows the time period between the taxicab arriving at Washington and Cherry and the teenagers initial observations. The shooter could have been long gone and the 'clean up' guy was taking care of business. Without the gun, his lack of urgency is measurable by his actions. I suppose in a way, the number of perpetrators is not really important, it is identifying the person or persons involved for the sake of all involved, but unfortunately I believe that chance was lost a long time ago. Reading the new book about BTK gives some possible insight to some of the questions raised in the article. When you consider the way certain serial killers will "prowl" or "troll" their victims to learn about their habits and routines before striking, it's certainly quite possible Darlene was a "project." The fact that her sisters and others talk about someone she'd been fearing, whether true or not, may lend credibility to such an idea. Darlene did not necessarily have to know this person. Maybe she sensed she was being followed or watched at times. He could know her, or of her, more than she knew about him. I think the car pulling in, then away, and returning later should be considered simultaneously with the idea that he shot five times, walked off, then came back with four more rounds. Both examples show a pattern of indecision and jittery thinking on the part of the perpetrator. He needs to steel himself or dig deep for courage before going through with these actions. Probably not all that surprising due to the seriousness of what he is doing. And also suggestive of someone who is new to this, lacking experience. In the BTK confessions, he reveals making similar errors and was plagued with the same type of doubts during his early crimes--especially in the Bright invasion. I think Zodiac stopped after the intial five shots because he was fearful of the noise and scene he may have been making. He wanted to get away but then realized these people could identify him if he didn't finish them off, hence the next four rounds. I have never taken seriously all the claims regarding Darlene Ferrin, many of which never surfaced at the time of the murder, only years later. A bit like the Mageau stories of being chased by a car and a man named Richard. This is like the William Cow exaggeration and Donald Fouke's 3712 Jackson Street. Even Don Cheney kept adding details to his stories of Arthur Leigh Allen, along with the Ralph Spinelli account. Sadly it's the attraction of the case that brings the 'Hollywood' out in people. Before you know it we have hundreds and thousands of people taking these accounts at face value. I agree with you most of the time Gregory, but on this occasion I don't feel it was indecision on his part that made him walk away and come back. I don't even believe the shaking, nervous person described at Lake Berryessa from accounts. To carry out bold attacks at Lake Berryessa and Presidio Heights, and in my opinion get stopped by Donald Fouke and pull of that deception shows cunning and calmness. The same calmness he exhibited by sticking around to tear of the shirt and amble around the taxicab. Michael Mageau described letting out a 'yelp' when Zodiac retreated that possibly made him return, quite the opposite of what Hartnell did in playing dead. If Zodiac had nine or ten bullets, just use them all. Once he had shot the first five, how difficult would it be to fire off the remainder in a couple of seconds. It may take a lot of courage for a 'normal' person to commit murder, knowing the possible consequences, but I am sure these serial killers don't moralize or worry about consequences. For somebody like the Zodiac Killer, I don't think courage comes into it. He may be a coward, but killing people to him, is probably no different to you or I swatting a fly. Morality is not the issue. If you don't fear the consequences of your actions, then the action becomes more routine. At the first three crime scenes he drove away, leaving all six victims still alive, if we include Betty Lou Jensen's changing position and David Faraday still breathing, according to Bidou. Had he wanted to, he most surely could have finished them all off, but he didn't. Maybe this simply wasn't the purpose, but the precursor to his letter writing campaign. I may be wrong Gregory, but there is more to this than just murder. If there was only one shooter at BRS why the apparent indecision of walking away and returning, driving away then returning, both actions just a purposeless waste of time. Unless two people were involved. If you've supposedly plucked up the courage to plan an attack that night, drive to the location and then shot off five bullets, just fire the final four to ensure the victims don't live. Apart from the gun jamming, which I don't consider a likely answer, it raises a red flag. I cannot believe that as Mageau leapt to the back seat, Zodiac didn't realize he hadn't killed him. Michael Mageau by his own admission said he was moaning in pain. Then Zodiac left and thought, "Oh I didn't kill him, I'd better go back".He already knew that, Michael Mageau wasn't playing dead like Bryan Hartnell. I would love to see the ballistics report. If Zodiac was expressing indecision and courage issues, he then decided to put himself in the firing line yet again, making a phone call forty minutes later from a payphone only yards from the police station. That takes balls or brazen cheek. Having said all that Gregory, I am not sure Michael Mageau is the most reliable witness. With bullets flying at him and under intense fear and stress, they say time slows down at moments of life and death. The exact time duration between the 'volley' of shots, or each one for that matter is questionable. It sounds daft, but Michael Mageau wouldn't be the best eyewitness under those circumstances. If the caretaker, who also heard 'gunshots' that night was correct, this may be the better option, however he was 800 feet away and it was July 4th, with fireworks going off. For all we know, the only pause between any shots, may have been when the shooter leant into the back portion of the vehicle, hence the casings found on the back seat floorboard. I'm sorry to say, but understandable, that the testimony of Michael Mageau should be treated with caution and not be regarded as factual. This certainly wasn't his fault, the poor man sustained life threatening injuries, under circumstances that would fragment most peoples memories. I don't mean to beat a subject to submission, Richard, but as I've said, reading this fairly new book "Confession of a Serial Killer: The Untold Story of Dennis Rader" has afforded me an interesting template upon which to review and reconsider aspects of the Zodiac case. Even though Rader was not influenced by Zodiac I'm at times astonished by the parallels between the two cases. Zodiac, of course, was not a sexual sadist--not on the level of Rader anyhow, but when I see the similarities between them (the M.O. in specific incidents, the letters to the media, the cat-and-mouse games, even deluded notions about their victims in the afterlife) I honestly believe they were trapped within the same pathology. I am not a psychiatrist, but perhaps this pathology occurs in one out of every 100 million people and is brought to an extreme at an even lesser, infinitetesimal rate. That these two killers lived in roughly the same era and culture, it should perhaps be less than surprising the manifestation of their illness resulted in the headline-grabbing terror carried out by each. I don't know how much you've looked at the Rader case, Richard, but in his second (known) attack he shot a young man (Kevin Bright) twice in the face, but miraculously this victim survived. I think the comparisons between Bright and Mageau are apparent. Like Mageau, Bright's subsequent account and description of the killer were viewed cautiously by police. (See 11:25 of this documentary: https://www.youtube.com/watch?v=DnsaEF4Kgt0) ..With the benefit of hindsight and Rader's arrest, we now realize Bright was actually quite accurate in his portrayal of his sister's killer. The composite sketch he rendered is a rather good likeness of Rader. There's obviously no way of knowing the level of Mageau's veracity of inaccuracy unless Zodiac were caught and gave a confession..But given what we've seen with Kevin Bright, perhaps Mageau should not be altogether discounted. Re: Zodiac's call 40-some minutes later if he was lacking courage. What I've learned about these people is that the murder is not even really what it's about. The thrill, the excitement is in the pursuit and the aftermath--most especially the cat-and-mouse game they like to play with police and the attention they want to receive from the media. Rader relates all of this in his confession; we also saw in his letters, just like Zodiac, that he was miffed when the news coverage of his crimes was lacking. But my initial point about Zodiac's possible reluctancy is taken directly from Rader's own accounts of how nervous he was when committing these attacks--most especially the early ones. You have to take into account Murphy's Law, as well.. No matter how carefully these guys may plan out what they want to do, all sorts of problems are bound to arise when carrying out a killing. When you pair this with the pumping adrenaline flooding their brain and nerves, it's more understandable perhaps that their acts don't appear entirely seamless to investigators or researchers. Probably 80-90% of these serial killers do get caught because something goes awry along the way, despite their best intentions. Rader--uncaught for 30 years--and Zodiac (having cast a narrower net and probably more lucky than skilled) are the exceptions to the norm. But I don't believe Zodiac had an accomplice. He had a psychological abnormality of some variety which compelled him to want to kill people, particularly young couples. I don't think he was fearless nor even cold-blooded. Lately I've been more strongly considering the notion that he may have actually been seen as a "good" person in the eyes of society. Think about many of these serial killers--i.e. Bundy, Gacy, Rader... Bundy worked at a suicide prevention hotline, Gacy met the First Lady, Rader volunteered at Church and Boy Scouts.. Their outward overcompensation of being "good" severely masks their inner depravity and ends up confounding the investigation. "Even Don Cheney kept adding details to his stories of Arthur Leigh Allen, along with the Ralph Spinelli account." Something that's interesting/peculiar about Zodiac, Richard, is that if guys like Cheney or Spinelli were just spinning a yarn and Zodiac saw the investigation was stringing cops along on false leads, why did he never say something? Being such an egotist, wouldn't he want to make it known that *He* is the one responsible, not person x, y, z, who may have been served a search warrant or falsely confessed. It's somewhat interesting that Zodiac never made any mention of the investigation or suspects, etc.. Given this knowledge, is it possible Zodiac was indeed someone police had their eyes on rather a person entirely undetected? Fair points Greg, I have watched many Rader videos and obviously it was more fascinating before he got caught. Obviously I'm glad he was, but the mystery is now gone. The similarities are many, apart from the sexual component, but I may go back and revisit some of the videos. Did you unearth anything from the Vallejo military school. No, Richard.. The Vallejo military yearbooks are fairly vast. I tried looking for individuals who may have specialized in wing maintenance, in accordance with the wing walker shoes, but there was really nothing of the sort. Oddly enough I sometimes find these cases more compelling after they are solved. Getting a clear picture of who the people responsible were and how they went about their business and then comparing these facts with what had been an enduring mystery is interesting and insightful. As I mentioned, I think this knowledge can be useful in applying to existing cold cases such as Zodiac.